DENVER, Nov. 28, 2018 /PRNewswire/ -- The Board of Directors of Apartment Investment and Management Company (Aimco) joined team members across the country for the Aimco Cares 21-Day Salute to Veterans - a national, company-wide campaign to honor the men and women who have served our country. The Aimco Directors led the way by delivering care packages for disabled veterans who live at the Colorado State Veterans Home in Aurora, Colorado. Throughout November, Aimco's philanthropic arm, Aimco Cares, spearheaded community service projects to support veterans and their families across the nation. These included preparing food and care packages for the Hoosier Veterans Assistance Foundation in Indianapolis; lending a hand at the Greenville veterans memorial ceremony in Greenville, South Carolina; preparing lunch for military families in Long Beach, California; providing food donations to veterans at the Soldiers Angels Mobile Food Bank in Denver, Colorado, and partnering with the Boston Bruins Foundation to raise more than $40,000 in a 50/50 raffle with proceeds benefiting Fisher House Boston. "Team members across Aimco appreciate the tremendous sacrifices that our veterans and their families have made so that we may live in freedom," said Aimco Chairman and CEO Terry Considine. "It is our honor to give back to these brave men and women through our Aimco Cares 21-Day Salute. The veterans who have fallen on hard times or who are spending their final years in hospitals or nursing homes hold a special place in our hearts, along with those who have recently returned from overseas duty. We are grateful for the opportunity to support them and demonstrate our gratitude for their service." 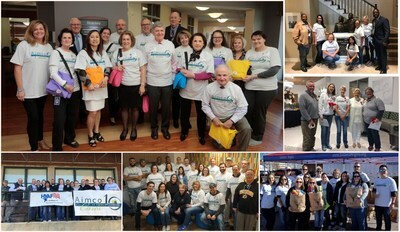 Through its Aimco Cares program, each Aimco team member is given 15 hours of paid time annually to volunteer for a nonprofit of their choosing. Aimco teams across the country will devote thousands of service hours this year in partnership with local organizations serving veterans and those in need. The annual Aimco Cares Charity Golf Classic, sponsored by Aimco's business partners nationwide, generates proceeds which Aimco directs to two national nonprofit military support organizations - Project Sanctuary and the Tragedy Assistance Program for Survivors (TAPS). In the last 11 years, Aimco has contributed more than $1.2 million to TAPS to support its peer support and crisis intervention program for military families who are grieving the loss of a loved one in the line of duty. In the last seven years, Aimco has donated $855,000 to Project Sanctuary to aid in its mission of helping military personnel reunite with their families after duty overseas and addressing the suicide and divorce rates so prevalent among that population. Aimco is a real estate investment trust that is focused on the ownership and management of quality apartment communities located in the largest markets in the United States. Aimco is one of the country's largest owners and operators of apartments, with 133 communities in 17 states and the District of Columbia. Aimco common shares are traded on the New York Stock Exchange under the ticker symbol AIV and are included in the S&P 500. For more information about Aimco, please visit our website at www.aimco.com.